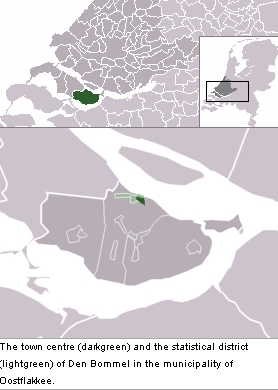 Den Bommel (coordinates: 51° 43′ 0″ N, 4° 17′ 0″ E) and Ooltgensplaat, two villages on the island of Goeree-Overflakkee, in the Dutch province of South Holland, where there was once a Mennonite congregation. On 25 August 1622 the Mennonites of Ooltgensplaat presented a petition to the council of Holland, asking that they might perform their marriages in their own meetinghouse, as they had formerly done. This petition was refused. In 1626 Willem Jansz Exsel (Exselt), as an elder of the Bommel congregation, signed the confession of J. Outerman, and in 1632 he and Gijsbert Spiering signed the Dordrecht Confession. The Bommel congregation belonged to the Flemish branch. In 1664 the congregation joined the Verbondt van Eenigheijdt, a union of conservative churches in the Netherlands. It was signed by Nicolaes Gerritsz and Cornelis Jansz Munster of Bommel. The congregation then had only a few members. Cornelisz Jansz Munster in 1676 moved to Rotterdam, was accepted there without attestatie (certification), for there was no longer a congregation at Bommel, neither preacher nor laymen. Cate, Steven Blaupot ten. Geschiedenis der Doopsgezinden in Holland, Zeeland, Utrecht en Gelderland, 2 vols. Amsterdam: P.N. van Kampen, 1847: v. I, 220, 330. Doopsgezinde Bijdragen (1899): 183; (1908), 114-115. Hege, Christian and Christian Neff. Mennonitisches Lexikon, 4 vols. Frankfurt & Weierhof: Hege; Karlsruhe: Schneider, 1913-1967: v. I, 245. Zijpp, Nanne van der. "Bommel and Ooltgensplaat (Zuid-Holland, Netherlands)." Global Anabaptist Mennonite Encyclopedia Online. 1953. Web. 20 Apr 2019. http://gameo.org/index.php?title=Bommel_and_Ooltgensplaat_(Zuid-Holland,_Netherlands)&oldid=144861. Zijpp, Nanne van der. (1953). Bommel and Ooltgensplaat (Zuid-Holland, Netherlands). Global Anabaptist Mennonite Encyclopedia Online. Retrieved 20 April 2019, from http://gameo.org/index.php?title=Bommel_and_Ooltgensplaat_(Zuid-Holland,_Netherlands)&oldid=144861. Adapted by permission of Herald Press, Harrisonburg, Virginia, from Mennonite Encyclopedia, Vol. 1, p. 385. All rights reserved.